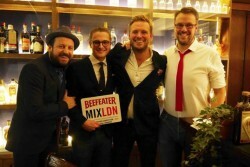 Beefeater has announced that Joe Schofield from The American Bar and The Beaufort Bar at The Savoy has been crowned as the national champion of the UK 2015 Beefeater MIXLDN Cocktail Competition. Battling fierce competition from over 12 contenders, Schofield impressed the prestigious panel of judges, with his Mother’s Milk cocktail. Tying into the competition’s theme of the evolution of London, his cocktail was inspired by 24 Milk Street, a residence previously incinerated in the Great Fire of London that was later home to renowned Victorian chef Isabella Beeton. Schofield will be treated by Beefeater to a three-day immersion in London’s cocktail history, where he will undertake a series of challenges that will test his bartending skills and will officially represent the UK in the Global Finals in January 2016. The winner of the title of BEEFEATER MIXLDN 2015 Global Bartender Champion will be mentored by experts as part of the Beefeater Global Brand Ambassador Programme. After in-depth one-to-one training at Beefeater: The Home of Gin in London, the Global Champion will represent Beefeater at exclusive events in their geographic region and travel to some of the world’s most prestigious bartender events, like the Moscow Bar Show and the Berlin Bar Convent.